Aides that assist in getting dressed are especially helpful for seniors who begin to experience a lack of dexterity, reach, and strength. Dressing aids make everyday tasks simpler and allow you to continue aging in place without a caregiver for independent living. Thankfully, there are specialized tools that work with specific articles of clothing with design features geared toward quick changes or removal despite any limitations you may have. 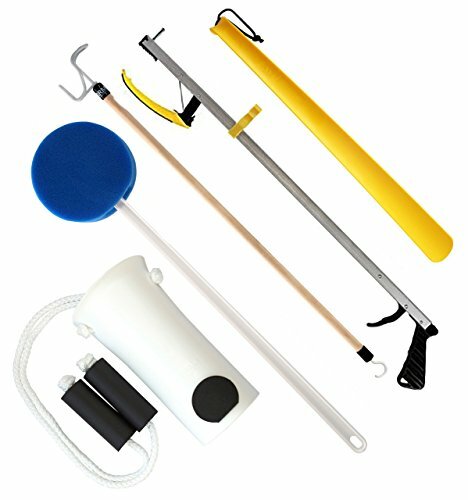 This versatile kit tackles several challenges of independent living with one purchase. BATHING INDEPENDENTLY: A 22" long Bath Sponge making bathing without bending and twisting easier. The RMS Premium 5-Piece Hip Knee Replacement Kit covers it all with five tools that provide solutions for a variety of challenges one faces when aging in place and/or live alone. Unfortunately, as we age bending, lifting, and twisting becomes more difficult and in some cases painful. The grabber extends your reach for both dressing and retrieving objects. The dressing stick can assist with putting on several types of clothing, making it a versatile tool that you’ll use every day.The shoehorn and sock aid is a vital aid for seniors who have trouble bending over to get ready for the day. Their designs are simple yet practical. The kit also includes a sponge on an extended handle so that you can take baths without uncomfortable twisting. The manufacturer provides a satisfaction guarantee and a limited lifetime warranty. The button hook makes dressing quicker and easier. 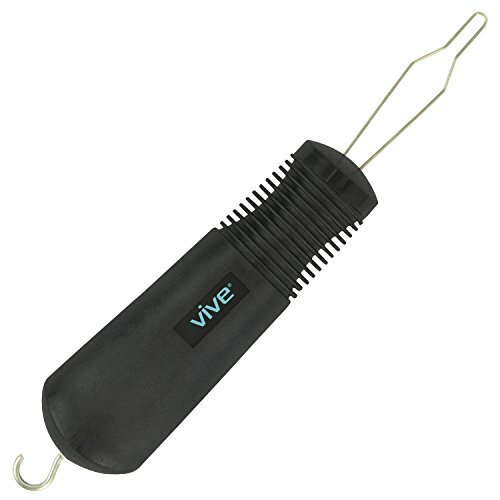 The Vive Button Hook is an affordable solution for seniors with arthritis in their hands or who have difficulty with handling zippers or buttons. The top portion is similar to a tool that those who sew use to thread needles, and it works just as effectively with buttonholes. The handle is a decent size with a comfortable hand feel to it. It is rubberized and ergonomically designed.The bottom of the product has a small hook used to pull up zippers. Both are made of steel. While they are useful, you may get more use out of the button hook to help you get dressed without assistance. Nevertheless, it is is a practical solution for an everyday problem to support your independent lifestyle while easing your frustration with limited dexterity. The aid is a simple solution that eliminates the need to bend over to put on your socks. MOLDED PLASTIC FRAME! Durable long lasting frame for everyday use. FOAM HANDLES! 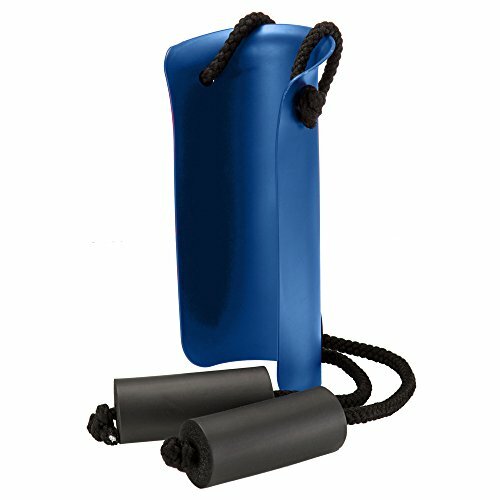 Deluxe foam handles for comfort and gripping ease for those with low dexterity. The Body Healt Sock Aid and Stocking Assist is another low-tech solution targeted toward a specific task. It’s not as intuitive as some assistive devices, however, it’s still very useful once you get the hang of it. Its value lies in the fact that you won’t have to bend over to put on your socks anymore. You just place each sock over the plastic frame and slip your foot inside as you pull it out of the sock.This is an excellent choice for seniors suffering through back pain that interferes with overall quality of life as they age. You can still get dressed independently without discomfort. The foam handles are soft and comfortable to hold. You can adjust the cord to the length you need. Just tie a knot to set it, making sure that it’s large enough not to slip through the hole. Some dressing aides like a reach grabber are practical for multiple applications which adds to their value. Assistive devices are innovative tools that allow you to do everyday tasks without help. This can improve the quality of your life and extend the time that you can live independently. Some products focus on particular aspects of daily living such as mobility whereas others tackle issues of limited motor skills or range of motion. The benefit of these dressing aids is that they provide practical solutions that are often affordable and easy to use. These two features may ease the qualms about buying them because they simplify difficult tasks in innovative ways. It’s also essential to consider the return on your investment with the additional support for an independent lifestyle, both mentally and physically. These products focus on activities of daily living like dressing. They may extend your reach if you find it difficult or painful to bend over to put on pants, socks, or shoes, for example. They may provide better leverage to optimize the actions of your muscles. They are often low-tech which makes them affordable while not detracting from their value. That also means that they are usually easy and intuitive to use. The first thing to think about when shopping for dressing aides is deciding what specific tasks you need help with to make independent living easier for you. If you have back pain, you may find an extended shoehorn useful to avoid discomfort. If you have arthritis, a device to help you with buttons and zippers can provide an invaluable service. These products typically have an ergonomic design that makes them comfortable to hold without any additional pressure that could interfere with their use. You’ll find them with rubberized or foam handles that are softer than materials like plastic. Bear in mind that your comfort in using them plays a pivotal role in their effectiveness for overcoming a challenge that you have identified. Some dressing aides like a reach grabber are practical for multiple applications which adds to their value. You may also think of them a godsend when you find an unexpected use for them such as picking up the keys you dropped on the floor. The more they can simplify your life, the better it is because it helps safeguard your aging in place if you can do more for yourself. Some products target specific tasks which are helpful because it takes the guesswork out of using them. Others are more versatile with your imagination the only limit to their functionality. You may be able to adjust them to suit different tasks and optimize their use in some cases. Whatever your need, you’ll likely find an assistive device to make your life easier. Since these assistive devices are a specialized market, the manufacturers strive to fine tune those details to make them indispensable for their targeted audience. They work with professionals in the healthcare industry to develop items so that you know the companies understand your needs. They often back their products with guarantees and warranties that protect your purchase as well. Dressing aids are a useful and practical way to support your independent lifestyle by simplifying everyday tasks that have become more challenging as you age. They allow you to get dressed without assistance or aggravating pain from chronic health conditions or limited mobility. And these products can extend your reach so you don’t have to stretch or twist. Some fall in the category of all-purpose and can serve a variety of functions. Others target specific tasks. Their use is often low-tech and straightforward so that anyone can find value in them. Their best quality is their ability to support your aging in place to allow you to live independently. That fact alone makes them priceless.